Background: Scorpion venom is the most expensive and deadly venom with exciting medical prospects and having a potential as a source of drug candidates. A number of scorpion venom peptides have shown promising site specificity and are involved in the regulation of biological mechanisms. Due to the structural and functional specificity, the scorpion peptides are widely used for the development of specific drugs especially for the cardiovascular and other immune diseases. 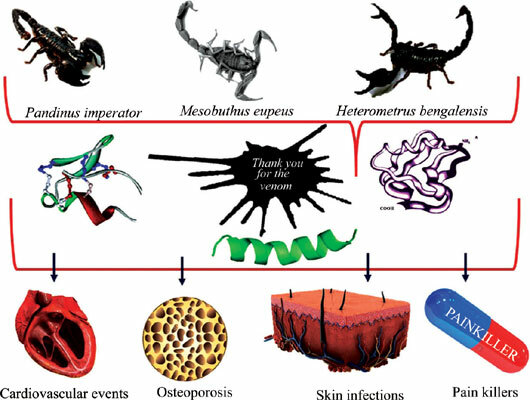 In this review, we summarize scorpion venom’s biological activities such as antimicrobial, antiviral, anti-cancerous and in immune diseases. Evolutionary perspective of peptides derived from different scorpion venoms are also described in this review. The most significant venom peptides are; Ctriporin, Chlorotoxins (cltx), Neopladine I and II, Meucin 24, Meucin 25 and Hp 1090. The most recognized scorpion species with pharmaceutical activities are; Pandinus imperator, Chaerilustricostatus, Buthus martensii, Mesobuthus eupeus, Leiurus quinnquestriatus, Tityus discrepans and Heterometrus bengalensis. Conclusion: The role of peptides in cardiovascular events and in treating osteoporosis signifies their importance. The role of peptides against pathogens, skin infections, pain-relieving effects, anti-malarial and anti-viral effects are discussed in detail. We further, summarized the classification of scorpion peptides among different toxins, their evolutionary process and the pattern of scorpion venom resource analysis. Scorpion toxins, venom peptides, ion channels, non-disulfide-bridged peptides, disulfide-bridged peptides, buthidae, chaerilidae.